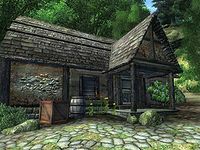 It is the base for an illegal drug operation and home to skooma refiners. You will find it by traveling the road just a small distance south from the city's west gate and it will be on your right. This page was last modified on 2 February 2019, at 03:17.